Time to face facts—I’m not getting younger. A few years ago I realized that if I’m ever going to mark some extreme (for me, at least) adventures off my bucket list I’d better get started. Here are the ones I’ve got under my belt now, most of which I’ve done in the past few years. Jump from an airplane. 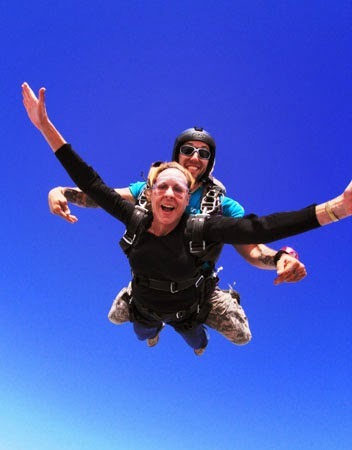 Okay, it was a tandem jump, and I didn’t have to pull the chute cord, but free falling was still a thrill. Actually I’ve been skydiving two times, and I’d go again if I could convince my “younger” friends to go along. Fly on a trapeze. In a class filled with darlings younger than my children, I was one of three students who actually got the eight-second trick right and got caught by a muscular aerialist hanging upside down on a trapeze at the other end of the apparatus. What a thrill! Zip half a mile across a lake. 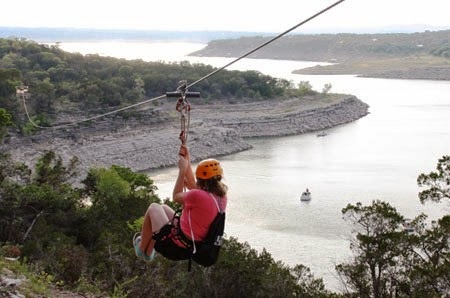 Zip lining really isn’t hard or scary; it just takes willingness to trust that a bunch of cables strung through a forest and across a valley or lake will zing you safely to the other side. It's an adventure you can find almost anywhere you travel these days, so we've zipped about 10 times all over the world. 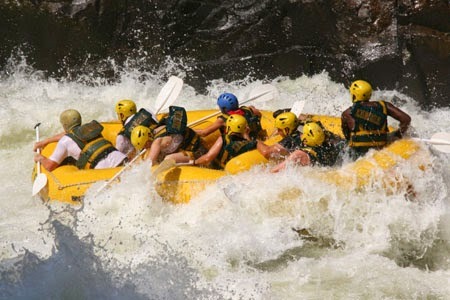 Go white-water rafting on the Zambezi River in Africa. Paddling through swirling class five rapids (six is the highest rating, and we had to portage around that one) will definitely get your adrenaline flowing, especially when there’s a fellow crew member threatening to purposely flip the raft. Don't be surprised when the raft is completely submerged for what seems like forever. Drive a dogsled. Hanging on tight to a frenzied, yapping string of huskies eager to get started on their “work” wasn’t an easy task. 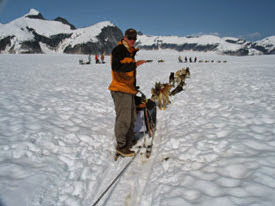 But keeping the sled upright as we sped across the Alaskan glacier from Juneau was a once-in-a-lifetime experience. Glide on wind currents. 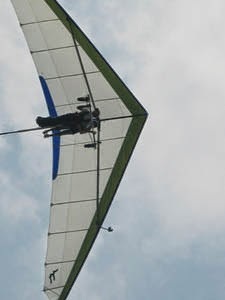 Hang gliding is another experience that is best done with an expert in charge. You still feel the thrill of drifting quietly through air without the responsibility of knowing all about wind currents. And your glider can be towed into the air rather than you having to jump off the side of a mountain. Ride a balloon into the sky. 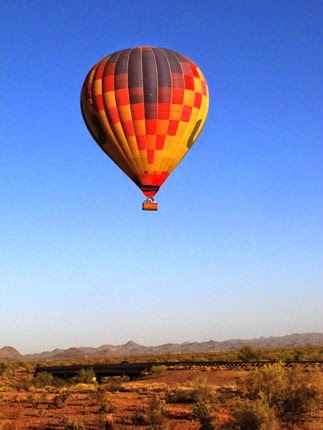 Hot air balloons provide one of the most peaceful ways of surveying the landscape, whether you’re gliding a mile above the Sonoran desert of Arizona, over elephants wandering the savannah in Africa, or near snow-capped mountains in Colorado. See the Grand Canyon from the bottom up. It’s one thing to admire this Wonder of the World from the top, to see a ribbon of river far below wind its way through massive rock formations. 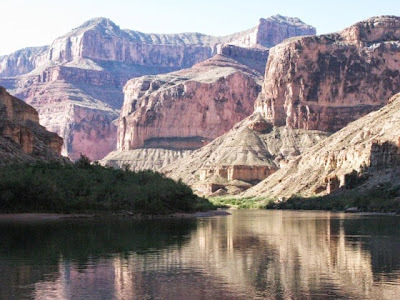 But how much more majestic the canyon appears when rafting through rapids on the Colorado River and looking up at the ever-changing geological formations. Did I mention we camped on sandy beaches and rock ledges for 10 nights? Incomparable experience. Watch polar bears in the wild. If you love wildlife, a visit to Churchill, Canada (1000 miles north of Winnipeg) should be on your bucket list. 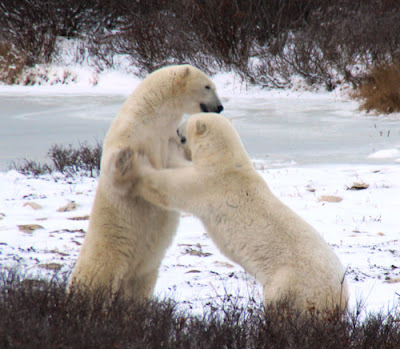 For six weeks each fall, during the polar bear migration to Hudson Bay, you can watch these incredible creatures interact in nature--males sparring, mamas with cubs, and more--while they wait for the bay to freeze over so they can hunt seals and fatten up for winter and spring. Close-up views provide an amazing experience. So true what you say and the challenge that I have is that my bucket list keeps growing - but ticking them off slowly but surely. You need to add White Shark cage Diving (and crocodile cage diving)- amazing. Can also add tandem paragliding!! All the best with ticking off the list!Will follow to see what you up to. Wow! shark and crocodile cage diving--hadn't thought of that! I know what you mean about the bucket list growing--mine, too. Sounds like you've had some wonderful experiences! Irene, I'm sure you have a bucket list, too. What's next for you? I'm actually impressed I've done 6 of these things. Wow. My big bucket list item has been bungee jumping in New Zealand, but I'm afraid if I wait too much longer my bones will snap!! !